Creating meaning from college’s end. One recent evening I wandered around a fraternity, stupefied, as a small human tragedy unfolded. Familiar faces flashed before my eyes. I wasn’t in the condition to make small talk, and neither were they. We were conducting the social whittling away that is endemic to modern existence. This process takes on added significance during the winter of one’s final year at Dartmouth. British anthropologist Robin Dunbar first posited in the 1990s that human beings possess the mental faculties to achieve about 150 meaningful relationships. He based his argument on the observation that primates with bigger brains have larger social groups. While this number is by no means definitive, a recent study also by Dunbar analyzing call data supports the idea of an upper limit on the number of meaningful relationships a human can maintain. Whether or not our brains are really equipped for the social environment in which we now live is up for debate. More than half of the world’s population live in cities, yet our species started out as small bands of hunter-gatherers. Does that shift in how we live affect how we perceive our relationships with other people? The idea that we can only maintain so many meaningful relationships is hardly surprising. We have all lost friends and built new ones. Some friends drift into and out of our orbit. Others drop off completely, never to appear in our social constellation again. Most people were never in our field of gravity in the first place. They had their own lives and losses. It can be tempting to impose a Newtonian understanding of these social mechanics onto our lives, but there is a randomness we choose to ignore for the simple reason that it is impossible to comprehend. What we should do instead is appreciate it. For example, I spent freshman year saying “hello” to a person I did not know. Whenever we crossed paths, we would just smile and raise a hand in greeting. We both thought it was pretty funny, until one day he said “hi” to me when I was looking the other way. I turned to see his retreating figure, stooped under spring rain. The next time we crossed paths, his eyes were locked ahead, determined never to be made a fool of again. What a small death that was — never mourned, never acknowledged. What if on that fateful day I turned back in time? Could we be friends now? Or would that infinitesimal connection between our two souls have frayed some other way? Did that loss lead us, however indirectly, into some other meaningful relationship? These are questions without answers, meant only to demonstrate how random our individual social structures can be. 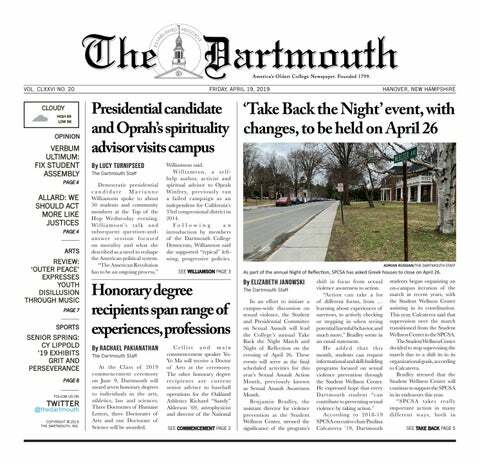 What seems to happen toward the end of Dartmouth is a narrowing and deepening of relationships. This retreat and retrenchment offers a refuge from the doubt and uncertainty of a social universe defined by amorphous chance rather than linear meaning. So we redraw the battle lines, sighing relief as we shed superfluous friends and hold onto the ones that remain. It makes everything easier. We occasionally venture beyond our network of trenches but only to enliven our existence. A nice lunch with a former close friend. An earnest talk with an acquaintance in the midst of a party’s mayhem. The open uncertainty of freshman fall has been replaced by a cloistered certainty. No one tells us how easy it is to think like this. It’s tempting to prune those connections until we are left with a neat map of relationships won rather than lost. Our lives make more sense to ourselves this way. With those snips, we can forget that randomness and possibility go hand in hand. It gives us the sense of an ending, but it’s just that — a sense.